But perhaps I’m getting ahead of myself. Don’t worry if you don’t happen to know anything about “Shazam!” or are convinced that you won’t care. I certainly didn’t. Plus, there are a lot of superheroes to keep track of these days and someone who needs an exclamation point is and should be immediately suspect. Freddy, with his wealth of superhero knowledge, helps Billy/Shazam figure out what to do with these new, strange talents. The training montages have a terrific comedic sensibility and Grazer and Levi are perfectly matched for the job. Levi in particular pulls off the tricky feat of playing a disaffected, but still fairly innocent young teenager while wearing spandex and a cape, no less. Grazer, meanwhile, who we’ve seen before in “It,” is beyond his years with his ability to draw a laugh. That’s not to say the movie is perfect. The beginning gives an extended origin story for both Billy and the little boy who will grow up to become the megalomaniac villain, Dr. Thaddeus Sivana (Mark Strong). Dr. Sivana is woefully underwritten, too, although Strong does his best being the straight, serious guy. For the most part it comes across as less of a threat and more of a buzzkill that gets in the way all the fun we were having with Freddy and Shazam. Also, as if Dr. Sivana wasn’t enough, the script gives him Seven Deadly Sins as henchmen. These sins take the form of unimaginative and indistinguishable CG gargoyles. I’m not exactly sure what lust or greed would look like in gargoyle form, but I’m pretty certain this isn’t it. They’re also given dubbed voices that feel about as authentic as the voices of the monsters The Power Rangers battled on Saturday mornings. 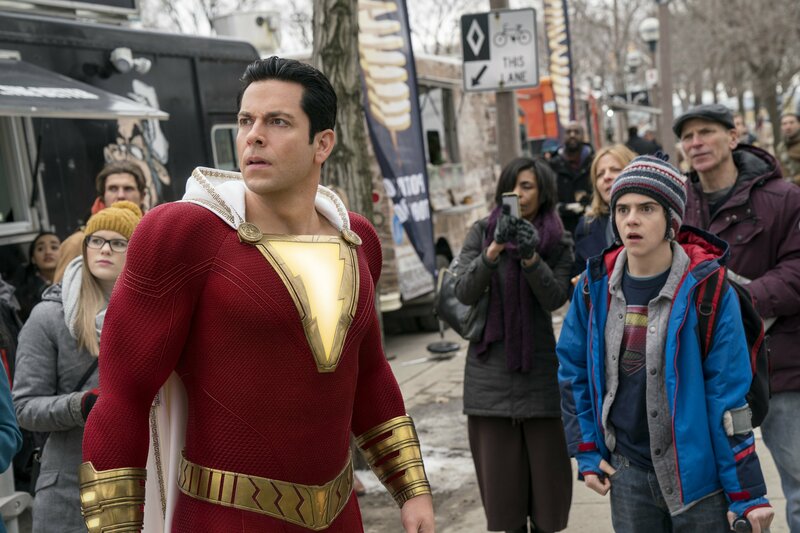 “Shazam!,” a Warner Bros. release, is rated by the Motion Picture Association of America for “for intense sequences of action, language, and suggestive material.” Running time: 132 minutes. Three and a half stars out of four.